Max Payne 3 Multiplayer Is a "Gang War"
Max Payne 3 multiplayer will feature mission-based battles, motion comics and the classic Max Payne narration, blending story-driven gameplay with the "spontaneous narrative" of online action. There aren't many shooters that are less obviously suited to multiplayer than Max Payne. It's simple enough to throw Max, Mona, Vladimir, Mike the Cowboy and all the rest into some deathmatch or CTF, but that hardly brings anything of value to the game. So how do you go about adding meaningful multiplayer to a game that has always been about a single man's descent into the hell of his own life? One big step was to create a new mode called Gang War, the "centerpiece" of multiplayer Max Payne which "attempts to give more definition to the spontaneous type of narrative you get in a round of multiplayer." A match may begin with a drug deal gone wrong, tasking players with returning cash-filled duffel bags to safe points. But once the round has ended, things change; the best player in the first round might find a bounty on his head in the second, or the losing team might have to grab turf from the winners. There will be a wide variety of missions in each Gang War to ensure that each one is different, and each new mission will be led into with a motion comic and Max Payne voice-over, just like the single-player mode. The idea is to provide a range of gameplay within a single Gang War that will keep one side from dominating. Multiplayer will also feature special abilities called "Bursts" that are unlocked through experience points. "Paranoia" forces the opposition to see their teammates as enemies, while "Sneaky" makes your gamertag appear as friendly to the enemy team and "Intuition" shows silhouettes of opposing players. Bullet Time will also work as a Burst, but it will be based on line of sight: if a player who has activated Bullet Time can see you, then your "reality" will slow down as well. It sounds interesting. It also sounds like a bit of a long shot, not necessarily in execution but in how mainstream gamers will react to it. There's a reason that Deathmatch remains the default multiplayer mode two decades on, after all; sometimes you just want to grab a gun and shoot a guy. 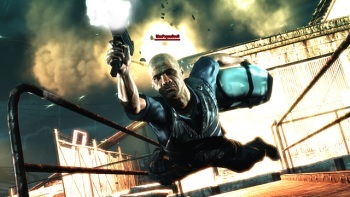 Max Payne 3 comes out in March 2012 for the Xbox 360, PlayStation 3 and PC.